On the Cover: Nearly an entire hemisphere of Mars appears in this enhanced color mosaic compiled from images taken by the Viking 1 orbiter. The great canyon Valles Marineris cuts across the lower center of the mosaic, from Noctis Labyrinthus on the left to the chaotic terrain on the right Three massive volcanos—Arsia Mons, Pavonis Mons and Ascrseus Mons (from lower left to upper right)—rise 17 kilometers from the surrounding plains. Computer manipulations such as this allow scientists to extract new information from old data, but to significantly advance our understanding of Mars we must again visit the Red Planet. 3 Radiation Risk and Planetary Exploration—The RTG Controversy: David Salisbury explains this power generating technology, and the recent controversy behind it. 8 Exploring Mars by Balloon: Jacques Blamont discusses the benefits of this innovative idea for exploring Mars. 3 Members' Dialogue Commentary on Russian and European space efforts. 11 World Watch Plans for Mars exploration, human spaceflight, and returning to the Moon. 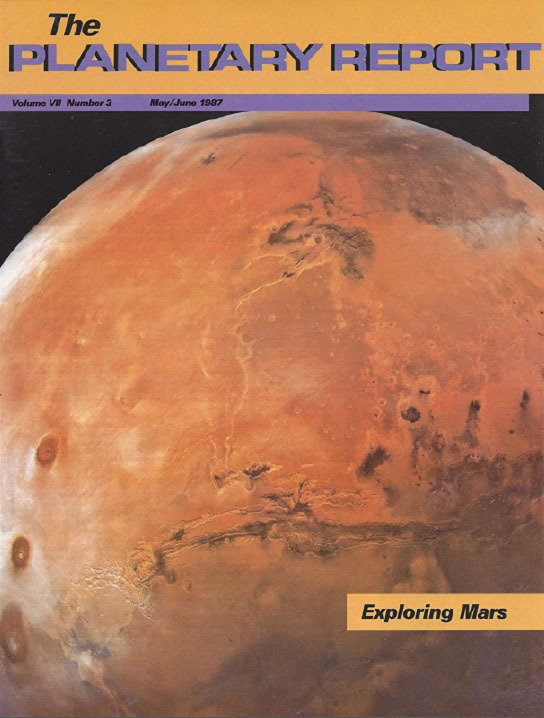 12 Society Notes The Mars Observer campaign. 14 News & Reviews Celestial cataclysm.